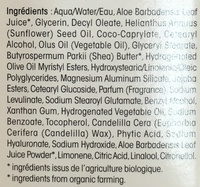 Aqua/Water/Eau, Aloe Barbadensis Leaf Juice*, Glycerin, Decyl Oleate, Helianthus Annuus (Sunflower) Seed Oil, Coco-Caprylate, Cetearyl Alcohol, Olus Oil (Vegetable Oil), Glyceryl Stearate, Butyrospermum Parkii (Shea) Butter*, Hydrogenated Olive Oil Myristyl Esters, Hydroxystearic/Linolenic/Oleic Polyglycerides, Magnesium Aluminum Silicate, Jojoba Esters, Cetearyl Glucoside, Parfum (Fragrance), Sodium Levulinate, Sodium Stearoyl Glutamate, Benzyl Alcohol, Xanthan Gum, Hydrogenated Vegetable Oil, Sodium Benzoate, Tocopherol, Candelilla Cera (Euphorbia Cerifera (Candelilla) Wax), Phytic Acid, Sodium Hyaluronate, Sodium Hydroxide, Aloe Barbadensis Leaf Juice Powder*, Limonene, Citric Acid, Linalool, Citronellol. Product added on March 30, 2016 at 10:20:32 PM CEST by tacite. 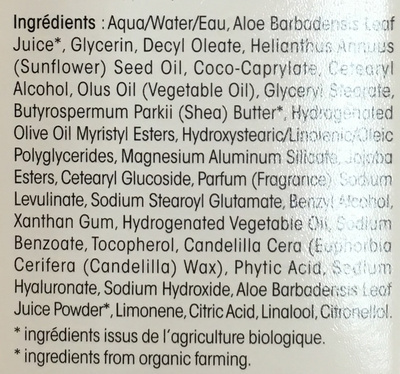 Last edit of product page on September 13, 2018 at 10:04:05 PM CEST by openfoodfacts-contributors. Product page also edited by miel2thym.